thank you a lot for the work on Konversation. The new GUI looks great. However, I am a bit concerned about the space utilization in the actual chat area. Will it be possible to have a condensed chat representation (like in Konversation 1.x, i.e., a one line per message representation)? I really like to have a good overview in the chats, especially since IRC chats tend to be crowded and old message may be soon moved out of the visible area with the fancy multi line representation (user + date above text) shown above. Thus, it would be great to have an option for a more condensed / classical representation. Yep, a compact/classic layout option will be available for sure. Great to hear that and "Ahh ... that's why there are times behind the messages as well :-P"
You mention persistence across network jumps (I assume that means disconnections from the network, e.g. when traveling by train) as something to improve, but then don't touch on it again. Is a konvi UI which can talk to a Quassel core something that could work? Or is Matrix then the place where you'd like persistence to happen? It's something that "could work", but it's not very appealing for a number of reasons. The comm protocol between Quassel's server and client is proprietary and implementation-defined - it's been around for a number of years, but hasn't spread for that reason and hasn't moved the needle on revitalizing the IRC ecosystem as a whole. The equivalent IRCv3 spec work (e.g. server-time, message batches and the history batch) are more relevant there but largely still pending server implementations - well, server-time is implemented in znc (which KDE runs an instance of) and we support it. Ideally we'd like network servers to implement that stuff directly (e.g. freenode), but it's more likely znc will. We'll expand our support for it as well. Matrix, where persistence already works and which bridges to IRC quite well, is possibly more viable by sheer momentum. From our POV implementing support for Matrix or Quassel is similar work, but the former explicitly encourages implementation and offers a much bigger return for the investment. Persistence is indeed pretty important, it is why I moved from Konversation to Quassel. I can't always be online and need to have the same logs on my desktop and laptop.... If Matrix or a similar tech could fulfill that need I'd be happy, too, of course. As long as it is easy to run/host, Quassel has been pretty neath in that regard. In either case, thanks for the work, this looks very good! 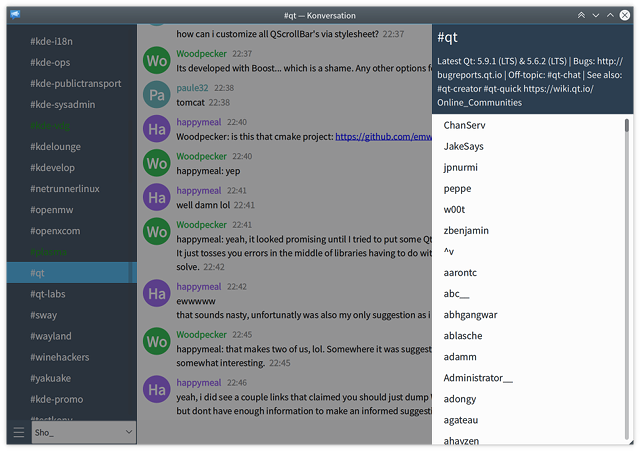 Is there any news about QtWidgets-like style for QtQuick? I ask that because all these new projects (Koversations 2, Kube, Discover) are really exciting, but they all look very alien for the KDE desktop (IMHO). I use Konversations, and I really wish it evolves, but I'll miss its interface, unless the new interface can have a QtWidgets-like style. We use Kirigami.Theme. * to get system colors, and UI elements such as buttons will be desktop-styled using the Qt Quick Controls 2 desktop theme that will ship with KDE Frameworks in the future (we'll depend on it and set it as default). 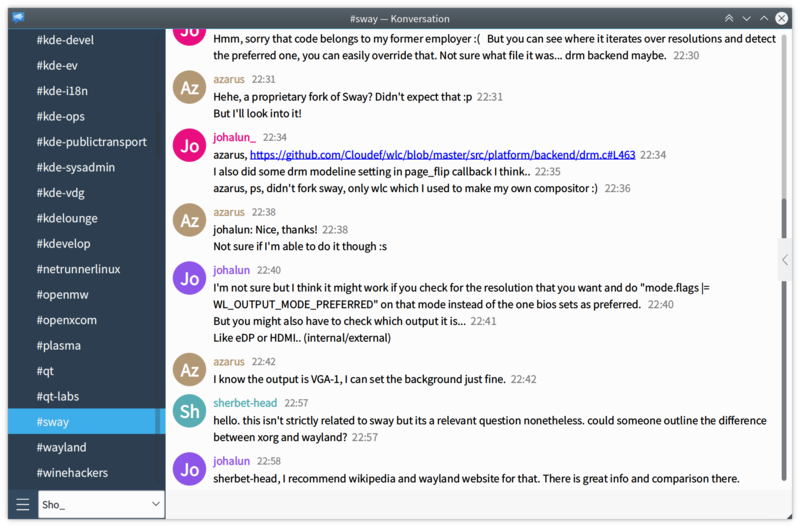 I think a big change like this should be treated in a completely new app, like Koko does with Gwenview and Kube/KMail.